Green River has traditionally been known as a way-station, a crossing-point, a pit-stop, but this unique village is more than just a place to pause. Like most towns, it has been shaped by many events that have dramatically impacted the shape of the city and its residents. Green River has a rich past full of booms and busts. The history of Green River begins before the settlement era since it was the most accessible crossing point on the Green River south of the Uinta Basin. The Old Spanish Trail forded the river about three miles upstream from the present town, as did the 1853 railroad survey under the direction of Captain John W. Gunnison. The site’s accessibility also made it a natural staging and supply point for travel on the river. the City of Green River started as a river crossing for the U.S. Mail. Settlement began in the late 1870’s in the form of Blake Station on the overland mail route between Salina, Utah, and Ouray, Colorado. The first permanent settlers of European stock were the families of Thomas Farrer and Matthew Hartman. The Farrers played a leading role in the community for several decades, operating a general store, a bank, and a ferry service. The railroad has played a major role in Green River’s history. In 1880 this small town of three families boomed into a tent-and-dugout town with workers coming to build the bridge and the road bed for the railroad. The completion of the Denver and Rio Grande Western Railway in 1883 made Green River a shipping point for livestock and mining equipment and supplies. Green River became a fueling and watering stop for the railroad with switching yards and engine sheds. Since there were no dining cars in those days a hotel (called the Palmer House) was built, and it became the scheduled meal stop for trains from both directions for many years. The influx of railroad workers gave the town 375 residents by 1890, in addition to a fluctuating population of cowboys, sheepherders, and prospectors from the Book Cliffs and the San Rafael Desert. The town’s location on the “outlaw trail” between Robbers Roost and Browns Park also contributed to its “wild west” reputation during that period. Green River enjoyed the railroad boom until 1892 when the railroad transferred most of its operations to Helper, Utah, cutting the population in half. Today, only the Amtrak passenger train stops in Green River, Utah. In the late 1940’s through the 1960’s (when the uranium boom ended followed by a brief recovery in the 1970’s) uranium dominated the economy of Green River. 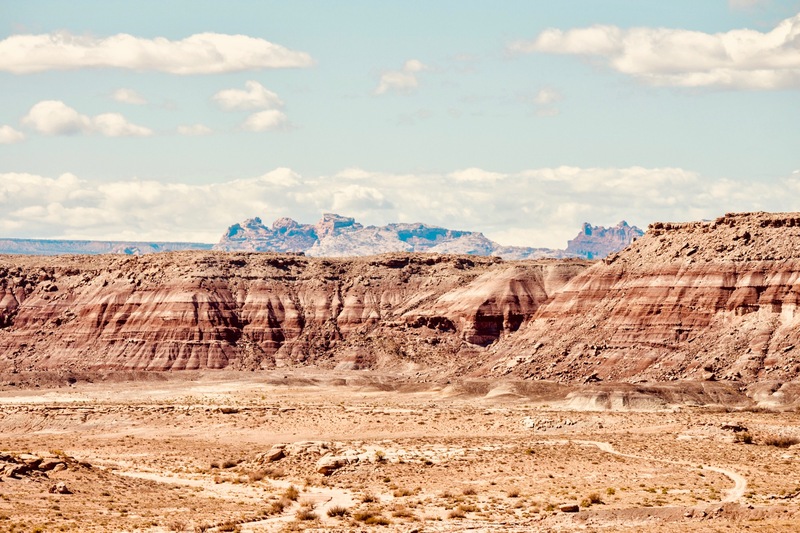 Several trucking companies based in Green River hauled the ore from the mines in the Four-Corners Mining District, the San Rafael Swell, the Henry Mountains, and near Lake Powell. The U. S. Air Force built the Green River Launch Complex (the new Area 51? ), just outside of Green River, in 1964. It was an annex of the U.S. Army’s White Sands Missile Range. From 1964-73 the U. S. Air Force launched 141 Athena and Pershing Missiles from the Green River launching area, near the Crystal Geyser. From those firings research was done to improve nuclear missiles. The Launch Complex brought the town’s population to a high point of almost 2,000 before the closing of the complex in the 1970s led to yet another economic downturn. Each of these boom cycles had some lasting impact upon the community. The “Farrer Subdivision” that makes up the southeastern portion of the town was a product of the railroad era. The “upper town” to the north and west was developed during the peach boom, a period that also saw the incorporation of the town in 1906 and the building of a high school in 1910. The Community Presbyterian Church was also established during this period. A Latter-Day Saint ward was organized in 1904, disbanded in 1915, and reestablished in 1923. During the uranium boom, Jim Hurst developed an innovative flying service to carry workers and supplies to remote mining locations. The successors to Hurst’s operation now carry on an active business flying river running parties. The “missile base” era brought new schools and civic services and saw the Community Church become the Green River Bible Church. Catholic and Baptist worship services were also instituted during this period. Unfortunately, these booms and busts have put the city into the mindset that it has to wait for something to come along in order for things to change. So, what will the next boom be… the nuclear power plant? Information taken from: Emery County Daughters of Utah Pioneers, Castle Valley: A History of Emery County (1949); Emery County Historical Society, Emery County, 1880-1980 (1981) and the City of Green River website. The Outlaw Trail was a large section of nearly two hundred miles. The Trail includes the area of Robbers Roost, Brown’s Hole and Hole-in-the-Wall. It was the refuge and hideout for Butch Cassidy’s gang from the 1880’s until the early 1900’s. It was easy to hide there because of the many canyons and draws to hide in, and getting lost for someone not familiar with the area was easy. Another person familiar with Robbers Roost was Matt Warner. Warner would steal cattle and hideout in Robbers Roost. Others who knew and used the Robbers Roost were the McCarty (McCarthy) gang. The Wild Bunch headed there after a Colorado bank robbery in 1889. Cassidy used it again in 1897, when he and another man, probably Elzy Lay held up the Pleasant Valley Coal Company payroll. Attempts were made to catch Butch and the gang but authorities could never enter Robbers Roost. Over the years Robbers Roost gained a reputation for not being able to be entered. Stories were told how men, a system of tunnels, fortifications and land mines guarded the Roost. It was also claimed that the Roost had a storehouse of supplies and ammunition making it impossible to enter. Lawmen seemed to believe some of these stories, some had no desire to try and get and outlaw out of there. Robbers Roost was mostly abandoned at the time that Butch Cassidy and the Sundance Kid left for South America. Many outlaws passed through there not only because of the Robbers Roost but because Green River was so remote and local friendships. Stories awe told of Butch and the youngsters of Hanksville playing jacks with 20 dollar gold pieces. Time to Allow: Take ten hours to drive or ten days to enjoy the byway. The Wild West folklore, legend and history is a rich part of Green River’s past. If outlaws and gunslingers interest you, Green River is a good place to start tracing back the fascinating lore of the region. Green River is the location of the official John Wesley Powell Museum, chronically the famous explorer’s historical trek down the river. Many artifacts and relics can be viewed in the museum. This collection honors the rich history of the area, and offers the visitor an indepth look into how this land looked during the early days of the west.